These are some of the more interesting new cars and concepts unveiled at Germany's International Auto Show. A Jaguar crossover SUV has been talked about for a long time and a concept version has just been unveiled at the Frankfurt Motor Show in Germany. 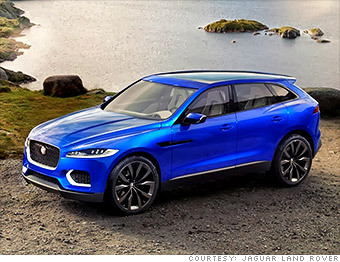 As it turns out, a Jaguar SUV wouldn't look too bad. For now, Jaguar is calling the C-X17 a "design study" with no mention, yet, of putting it into production. The big news with C-X17 is that the technology used for this crossover's lightweight aluminum body will form the basis for a whole new line of Jaguar cars. The first of these will be a new mid-sized four-cylinder-powered sedan that will go on sale in the U.S. in 2016.